Bridgwater & Albion RFC currently feature three senior teams based at the College Way ground. Bridgwater & Albion RFC are proud to hold the ‘RFU Accredited Club’ status. 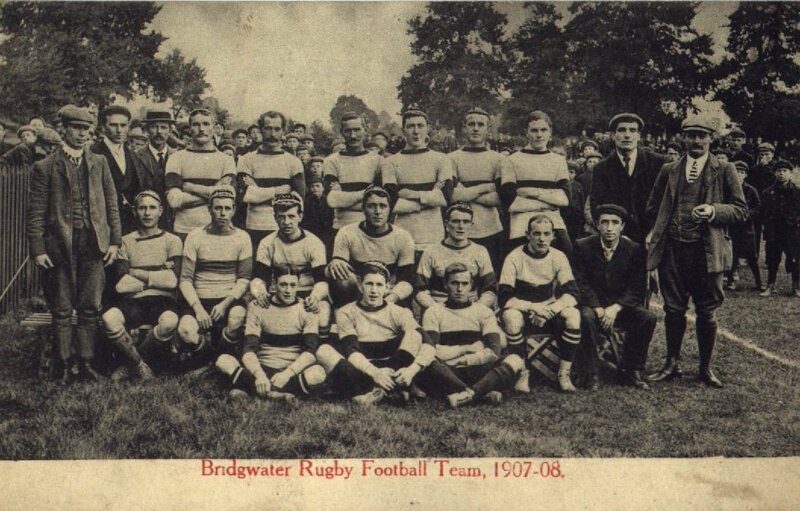 As the popularity of rugby football swept through England and particularly the West Country, it was no surprise that the game caught on in Bridgwater and in 1875 the Bridgwater club was founded. Sixteen years later, the Bridgwater Albion Football Club was formed in September 1891 and the two clubs remained as great rivals until the First World War. Immediately after that the clubs merged to form Bridgwater & Albion Rugby Football Club. Both before and after the merger the game in the town was and always has been strong. Bridgwater followed in the footsteps of other Somerset clubs – Bath (1865), Wiveliscombe (1872) and Wellington (1874). Also in 1875 clubs at Taunton and Weston-Super-Mare were formed with Chard following a year later. Such competitive environment in the County soon led to the creation of the Somerset County Rugby Football Union in 1882. The clubs supplied several England internationals both before and after the First World War with Bob Dibble and Tom Woods leading the way. The former captained England Rugby Union and also toured New Zealand with the British Lions, whilst the latter switched to Rugby League and captained England in the 13 man game. The renowned SMJ (Sammy) Woods – an Australian with an equal enthusiasm and skills level at both rugby football and cricket – played for the club – he was capped 13 times for England. After the First World War, Jack Swayne was capped for England followed shortly afterwards by Jimmy Barrington – a local solicitor who played his formative days at Bridgwater & Albion but was capped when with Bristol. The club had a formidable reputation both on and off the field and was able to play to a high standard and was always one of the leading clubs in Somerset, the West County and England. Just before the Second World War the legendary Prince Alex Obelensky guested for the club whilst stationed at Westonzoyland Air Camp – his two tries for England against New Zealand remain as two of the best of all time. Sadly he was to die in service of his adopted country. At this time the Taunton Road (Broadway) Ground was commandeered for allotments and war-time rugby took place at what is now Victoria Park. The ground was repossessed in 1946 and an energetic committee sent about restoring the club to its former status and glories. The famous Grandstand was erected in 1952 and a new clubhouse built in 1963. A year later Albion were one of the pioneers of floodlighting south of Bristol and used their lights to attract several high quality visiting teams. Throughout the first 100 years of the club’s existence many players had played for and were capped by Somerset County. Perhaps one of the highlights was the visit of Harlequins in October 1973 in the English Rugby Union Knock-Out Cup when Albion surprised the famous visitors just going down 6-12. 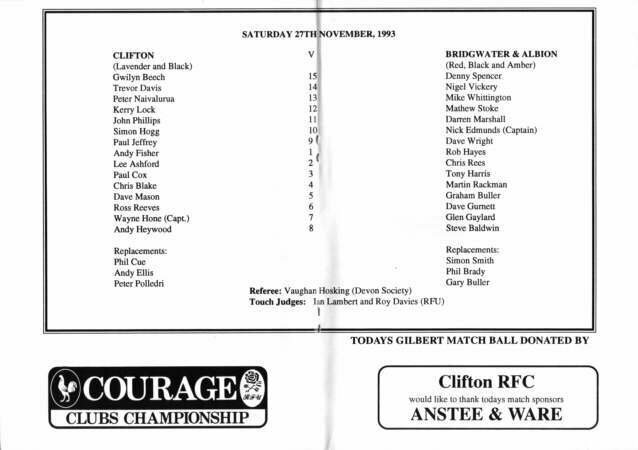 In 1977 the locally groomed player – the now late Charles Kent – was capped by England whilst playing with Oxford University and Rosslyn Park but he honoured his home town club by bringing his full Blues side to play Albion. When leagues were founded in 1987, Albion were placed in South West One (Level 5), a tribute to the strength of the fixtures list and the performances within that. Alas, Albion did not take too kindly to league interference and soon slipped down two divisions. It was whilst plying their skills from the then South West Two in 1993 that Albion again embarked upon an impressive National Cup run ending up being defeated in the fourth round by Newcastle-Gosforth of the Premiership. In May the following year, Albion upped sticks from their beloved Broadway Ground when an opportunity arose to sell the ground to a supermarket. The club decamped at its current location at College Way on Bath Road with two playing areas, a mighty clubhouse and other spacious facilities. The players did the club’s profile no harm when achieving promotion to National League (Level 4) for the first time in 1997 for a three year span. Later after reconsolidating in South West One, the club returned to National Level again in 2005, remaining there until 2010. During this period a further National Cup run one year saw the revisit of Harlequins – alas only honour ruled this time as the then Championship side won convincingly. The famous Moseley club also visited in the same competition in a later season. Sadly a further relegation leaves the club at South West One West (Level 6 in 2013) but with an opportunity again of regathering and pushing on to regain earlier glories. Since the re-introduction of the Somerset Knock-Out Cup in 1970, Albion have won the County Trophy ten times – a record to date. The club has always provided football for its three senior sides and Colts XV and in the last 20 years has developed an ever burgeoning Mini, Junior and Youth section intent on supplying the senior sides with ready replacements for many years to come. Bridgwater & Albion Rugby Football Club by virtue of its history, status, style and renown, is one of the prized features of Bridgwater life. The club is fast heading to its 140th anniversary and will be seeking to ensure that the game lives on in the town for ever.